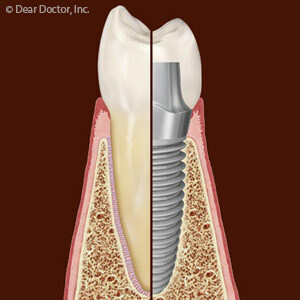 If you’re considering different options for tooth replacement, dental implants are likely high on your list. Implants have a proven reputation for both durability and life-like appearance that can restore mouth function and revitalize your smile. There is one aspect concerning implants, however, which gives people pause — the surgical procedure required to place the implants in the jawbone. If you’re leery about undergoing this procedure we can put your mind at ease — for most patients implant surgery is a minor, pain-free process with little discomfort afterward. While there are variations in style, implants generally have two major components: a titanium post that’s implanted into the jawbone and a permanent life-like crown that’s affixed 6 to 12 weeks after implant surgery. Titanium is the metal of choice because of its affinity with bone cells; over time bone will grow to and attach itself around the implant, a process known as osseo-integration. The metal post is normally spiral in shape, allowing it more surface area for bone to adhere to. In the beginning of the procedure we administer local anesthesia to fully numb the area before proceeding. After accessing the bone through tiny incisions in the gum tissue, we create a small channel in the exposed bone. A surgical guide may be used to prepare the precise location for the implant with a series of drilling sequences that increases the channel until it matches the implant size. While this takes place, you should only feel a mild vibration and a little pressure from the drill. The implants are then removed from their sterile packaging and placed immediately into the prepared site. The gum tissues are then sutured into place with self-absorbing sutures. Most people have only mild discomfort after the surgery that can be managed with a prescription-strength non-steroidal anti-inflammatory drug like ibuprofen. We may also prescribe antibiotics and other care instructions to ensure successful gum tissue healing. With proper planning and precise implant placement by skilled hands, implant surgery is an easy and uneventful procedure. And, with your new crowns in place, your new, beautiful smile will make the experience a distant memory. 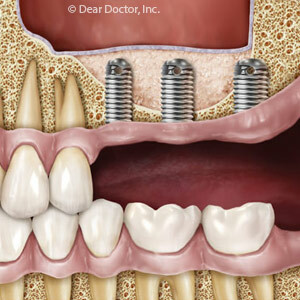 You’ve probably heard a lot of great things about dental implants as a replacement for missing teeth. But there’s one aspect about implants that may cause you hesitation about choosing them: the cost. If you have multiple teeth to be replaced, the expense of implants may seem even further beyond your means. But before you decide against what’s widely considered the premier tooth replacement option, it would be beneficial for you to look at their cost from a long-term perspective. You may find implants are actually a cost-effective investment in both your oral health and your smile. 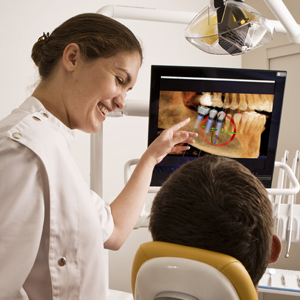 So, what sets the dental implant apart from other options? One of its most important attributes is its life-like appearance. 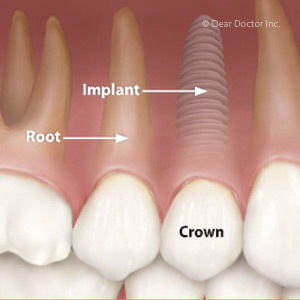 Not only does the visible crown resemble the color, shape and texture of natural teeth, the implant’s placement can so precisely mimic the appearance of natural teeth emerging from the gums, it’s indistinguishable from the real thing. They’re not just attractive, but also durable. This is due in large part to titanium, the most common metal used in implants, which has the unique quality of being osseophilic, or “bone-loving.” Bone cells naturally attract to titanium and over time will grow and adhere to the implant in a process known as osseointegration. As a result, the implant’s attachment in the jaw becomes strong and secure. This durability gives implants a greater longevity on average than most other replacement options. If you thus compare the total costs for an implant (including maintenance) over its projected life with the costs of other options like dentures or fixed bridges, you’ll find implants may actually cost less over time. That may sound affordable for one or two missing teeth — but what about several? Replacing multiple teeth individually with implants can be quite high; but implants are also versatile — just a few strategically placed implants can support a fixed bridge or overdenture. This “hybrid” solution combines the affordability of these other options with the stability of implants. Before weighing your options, you should first undergo a complete dental examination to see if you’re a candidate for implants. From there we can help you decide whether implants are the right investment for your health and your smile. Unlike the natural tooth it replaces, a dental implant is impervious to decay. But don’t think that means you can relax your oral hygiene habits — even though the implant itself can’t be infected, the surrounding gum tissues and bone can. And if they’re not properly cared for you might eventually lose the implant. In fact, implants may be more susceptible to problems from impacted food that becomes wedged between the gums and teeth than their natural counterparts. 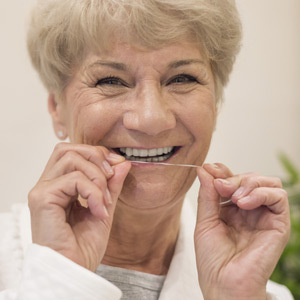 Natural teeth are connected to the jaw by way of a resilient, elastic tissue known as the periodontal ligament: the ligament resides in the space between the tooth root and the bone and attaches to both through tiny fibers. The bone and ligament are protected by an attachment of gum tissue that covers all of the surrounding bone and attaches to the root surface. The outer gum tissue surface is covered by a protein called keratin that makes it resistant to wear. On the other hand, these periodontal ligament fibers don’t exist when implants are present as the implant is fastened directly to the bone. Because it doesn’t have this ligament attachment, and the gum tissues around can’t attach to the implant as with natural teeth, it may be more vulnerable to bacteria or trauma caused by food impaction. So, cleaning and caring for dental implants is just as important, if not more so than with natural teeth. If the gums around an implant become infected and inflamed it could lead to peri-implantitis, a condition that can destroy the bone attachment between the implant and the bone. In other words, the loss of bone support can weaken the integration of the implant with the bone. As more and more attachment is lost, the implant can loosen and eventually be lost. The best way to avoid this is with consistent daily hygiene and regular dental checkups. And, if you notice any signs of swelling or redness of the gums around an implant, contact us as soon as possible. The sooner we begin treatment to alleviate the infection, the less danger there will be of losing your implant. For a predictable outcome, a dental implant should be placed as soon as the bone and gum tissues following a tooth extraction have healed. But what happens if the tooth has been missing for months or years? You might then run the risk of not having enough bone to properly place an implant. This can happen because of a disruption in the growth cycle of living bone tissue. As older bone cells dissolve (resorption), new bone develops to take its place. This is a dynamic process, as the amount and exact location of the new growth is in response to changes in the mouth, particularly from forces generated by the teeth as we chew. If, however, this stimulation transmitted to the bone no longer occurs because the tooth is missing, the bone will tend to dissolve over time. In fact, within the first year after a tooth loss the associated bone can lose as much as a quarter of its normal width. This is why we typically place bone grafting material in an empty socket at the same time as we extract the tooth. This encourages bone growth during the healing period in anticipation of installing a dental implant or a fixed bridge. If, however, the bone has diminished to less than required for a dental implant, we must then use techniques to encourage new bone growth to support a future implant. One such technique for restoring bone in the back of the upper jaw is to surgically access the area through the maxillary sinus (a membrane-lined air space within the bone structure of the face) positioned just over the jawbone to place grafting material. During surgery performed usually with local anesthesia, the surgeon accesses the sinus cavity, lifts the tissue membrane up from the sinus floor and applies the grafting material on top of the bone. Eventually, the new bone growth will replace the grafting material. If successful, the new bone growth will be sufficient to support an implant. Thanks to this renewed growth, you’ll soon be able to enjoy better function and a transformed smile provided by your new implant.